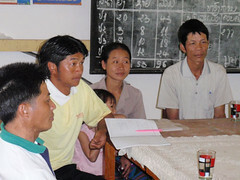 The Mon school in Beng district in Oudomxay has 98 students and 3 teachers (pictured). In total there are 4 classroooms teaching grades 1-4, with children travelling to a nearby town to attend secondary school. Next year 2 more classrooms will be built.